Located 13 miles from Yoakum, TX, this 123-acre ranch is a beautiful combination grazing and hunting property. 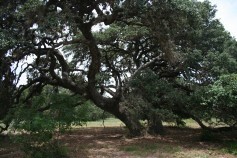 The ranch is approximately 60% wooded with massive live oak, post oak, water oak, and cedar, and 40% improved pasture. With a 5-Acre lake, water well, excellent fences, several barns, and 2,000 feet of frontage on FM 682, this ranch is set up nicely for the next owner to add their personal touches. A 12-mile drive from Downtown Victoria, sits an outdoorsman’s paradise. The ranch is 262.36 deeded acres, with an additional 119.63-acre leaseback from the GBRA. 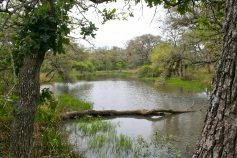 The ranch has 7,800 feet of shoreline on the 3,100-acre Coleto Creek Reservoir, home to some of the best bass fishing in Texas. Loaded with hundreds of huge live oaks, the ranch offers incredible hunting. 25 percent minerals convey. Offering a percentage the Minerals. This 1,558 acre ranch is located 1.5 hours west of Houston, 8 miles south of Sheridan, TX, 1/2 mile off of FM 2437. Tracts this large in Lavaca County are rare to find. Covered in huge live oaks and post oaks, this incredible hunting property has 1.7 miles of seasonal Ragsdale Creek running through it, offering sandy, rolling terrain. A percentage of the minerals will convey. MINERALS! This high fenced 874 acre ranch is located 5 Miles west of Dilley, TX on Hwy 117, in the heart of South Texas. 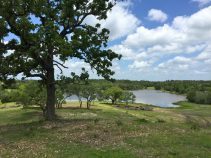 This prime hunting ranch is heavily wooded with diverse native brush and bull mesquites, has rolling terrain with stunning vistas, and excellent water including a ~300 GPM Carrizo Aquifer irrigation well, and 4 ponds, 2 of which have water piped to them. The property offers a very nice 1,500 square foot house, barn, and working pens. Most importantly, this ranch is being offered with 1/8th of the minerals and executive rights and slightly less than 1/8th of the royalties in the Eagleford Shale, and is not currently leased, and has no production. Located seven miles west of Lampasas, this 353 acres has it all. High-fenced with all galvanized tightlock fencing, improved whitetail genetic deer herd, nice lake, mature tree coverage, hunter’s cabin and old barn, kleingrass fields, and three miles of underground water piping through the ranch. 100 percent of the minerals will convey. This extraordinary 492-acre ranch has been in the same family for 50 years, and is located between Austin and Houston, near La Grange, TX. It has a “Hill Country” feel, with over 100 feet in elevation changes, dramatic hills, rugged draws, and ancient rock formations. Rare in this prized area, it is 90% wooded with a variety of large timber. The two 8-acre lakes and two seasonal creeks are the centerpieces that set this ranch apart as one of the most unique recreational properties within 1.5 hours of Houston. This beautiful 301 acre ranch is located on the Eastern city limit line of Cuero, TX on Hwy 87. This prime property is filled with huge live oaks and native brush, as well as some open grazing pasture. There is approximately 1 mile of Oaxley Branch Creek that traverses the property, offering rolling terrain with excellent home sites. The West boundary line is the Cuero city limit line, and the South boundary line is 1,500 feet of Hwy 87 frontage. City Utilities are located at the SW corner, next to the Tractor Supply. This property would be perfect for development or a nice sized recreational ranch close to town. Minerals available. Located 100 miles from Houston, this 145-acre ranch is heavily wooded with massive live oaks. With a mile of seasonal Sandy Creek along the western boundary, the ranch is highly traveled by deer, turkey, and hogs. Tucked away among the oaks sits a very nice modern cabin with a wall of windows and a wraparound porch. There are also two ponds stocked with bass and catfish. This 160 acres is an awesome hunting ranch, located between Berclair and Beeville, with great access just one mile off of Highway 59. 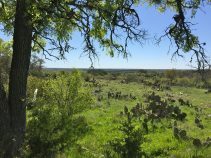 Half of the ranch is thick native brush and big live oaks, and half of the ranch is five-year-old mesquite regrowth and native grasses. 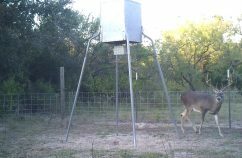 Deer, turkey, hogs, as well as dove and quail. 90 percent of the executive rights will convey. Earthstone Exotics is a 200 Acre high-fenced ranch located an hour outside of Houston, offering year round, full service hunts for exotic wildlife. More than just a hunting ranch, the property offers a family friendly atmosphere for corporate retreats, team building events, family gatherings, and shooting competitions. The facilities can comfortably sleep up to 24 guests. Featuring custom rustic lodges, barns, a 1 acre lake, shooting ranges, and numerous exotic wildlife, this is an excellent recreational ranch close to Houston.